For a higher air quality at home, Electrolux brings you the S-bag Clinic. Guaranteed to fit in any Harmony canister vacuum or Oxygen canister vacuum, this bag cleans your house 5 times better than ordinary bags, filtering 99% of dust and allergens through its high-tech 3-layer filtration system. 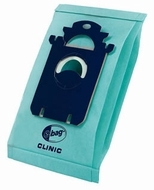 Among the world's best high filtration bags, the S-bag Clinic is easy to use and ideal for allergies and asthma sufferers.